The ruling party has since seized upon this favourable outcome as evidence of the PF’s electoral ascendance and the UPND’s gradual decline. PF Media Director Sunday Chanda argued that the result of the Chilanga poll indicates that the main opposition “is losing ground everyday and with every election. UPND bases and members are fatigued with the leadership of Hakainde Hichilema [in contrast to] President Edgar Lungu [who] is gaining popularity with every single election”. For its part, the UPND attributed its defeat to the ‘warfare-like violence’ that took place on polling day, which, according to party Secretary General Stephen Katuka, prevented many of its supporters from voting. Other commentators have argued that the UPND gifted the seat to the PF because of the opposition party’s adoption of a morally compromised candidate. Musonda, who was in the company of Mukata at the time when the shooting of Kalila Kwenda occurred, was arrested alongside the then Chilanga lawmaker, with whom she had an affair, but was ultimately acquitted by the High Court. Traditional UPND supporters, critics argue, may have either stayed away from voting or switched to the PF in protest against the adoption of a candidate who was fresh from a murder charge and had an affair with a married man. Finally, those suggesting that the UPND may have lost the seat because of the choice of its candidate, a supposedly morally repulsive one, are undermining the effectiveness of the PF campaign strategy, ignoring the fact that Musonda was the grassroots’ preferred candidate during the primary poll and are arguably projecting their own notions of moral integrity onto Chilanga voters. The truth is that moral considerations have never weighed heavily on the electoral scale of concerns of many Zambian voters and there is no evidence that the electorate in Chilanga is an exception to this general norm. Our recent political history is awash with examples of individuals with dilapidated moral infrastructure who ascended to elective public office at various levels. In fact, if morality was an important factor in our electoral politics, Rupiah Banda, Michael Sata and Lungu would never have come anywhere near State House. It is also worth noting that the top four of the nine candidates that Musonda, a Bemba, defeated with wide margins in the primary, were all Tongas. Had the UPND central leadership imposed any of them on Chilanga, critics may have seized on this move as further evidence of the party’s commitment to Tonga ethnic particularism. Such a move could have also alienated the grassroots. What this picture demonstrates is the need to seek other explanations for the Chilanga result beyond the existing narratives. Second, the PF’s victory in Chilanga was secured by the advantages of incumbency. Nearly all Cabinet ministers and several PF MPs from Lusaka and elsewhere camped in Chilanga to campaign for Langa. Vast amounts of state resources were poured into the area and deployed for partisan use. Some voters were reportedly bribed with cash and other luxurious goods to vote for the PF candidate – a strategy that has proved effective in securing the support of impoverished electors, especially those deprived of the enlightening knowledge of ‘Don’t Kubeba’. (A similar strategy of extensive vote buying was successfully deployed by the PF in the Lubansenshi parliamentary by-election in September 2015.) In addition, a number of previously unattended roads were suddenly either tarred or paved. One elderly Chilanga resident who voted for NAREP’s candidate told me that he hoped ‘there would be another by-election in the constituency soon so that the remaining roads can also be tarred’. 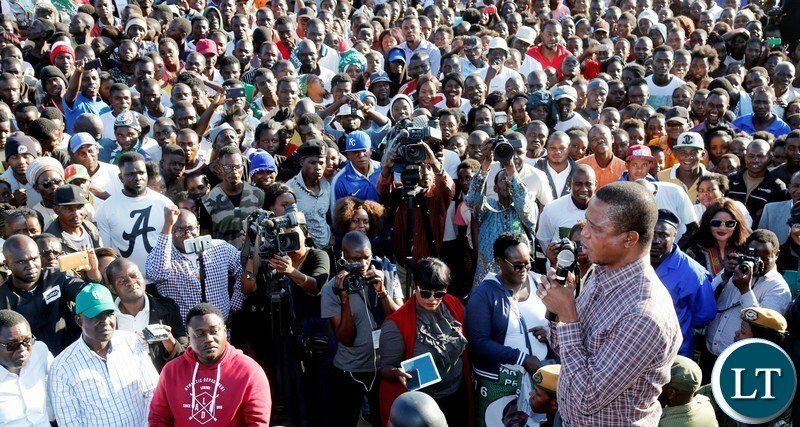 To crown it all, President Lungu, campaigning in the area a few days before polling day, warned Chilanga residents that they will not receive development or tangible benefits from the State if they voted for the opposition, especially the UPND. (In a country with a functioning judiciary, such careless utterances by the President provide sufficient basis for invalidating the results of the Chilanga poll if petitioned. The problem is that even if the High Court disposes of the case within 90 days, as per the law, the Constitutional Court may take up to 2021 to conclude a possible appeal arising from the ruling of the lower court, as ably demonstrated by its snail-paced movement in the now ancient appeal cases of Munali and Lusaka Central constituencies.) Outspent and unable to match the PF’s bottomless financial muscle, the opposition tumbled. Voter bribery ,threats to with hold development ,party cadres unleashing violence and rigging.I don’t know which one but these are the tools we use in Zambian elections. Is there a PF blogger or supporter who can ATTEMPT to respond to a perspective that differs markedly from theirs with reason and a persuasive argument, not insults or name calling? Just look at the insults and labels below! No attempt whatsoever to dispute any point of Sishuwa’s sober analysis with reason. Yangu Tata Lesa, are we Zambians this daft? The article by Sishuwa Sishuwa or chishupu chishupu, for sure you are not sure. Look how long the article is with clear biasness. Ndiwe chishupu chishupu for real. Bo Sishuwa, who is to say that UPND is clean and innocent of any brown envelope shenanigans. If they can do the violence just like their opponents, they are also very capable of bribery, they have experts at bribery at the very top, GBM, Kambwili even HH himself. Your analysis is highlights your bias for HH and his cult. Sishuwa whatever you name is you have not said anything about your leader HH.The man has expired you need new blood to lead your party.Stop being indirectly critical of Chagwa or PF come up with issues of real concern,Jobs or talk about how UPND will improve the economy.Go to the people and explain your policies that will turn around the economy.stop targeting Chagwa because you will be sorry in 2021.Change the tone of your articles which you write to boost support for your small GOD HH. Typical PF thinking. For you, anyone who dares to disrupt your point of view can only be a UPND supporter. I doubt you even read Shishuwa’s article, you probably relied on entrenched prejudices to make your comment. What a sad life! Sishuwa, there was no need for you to write such a lengthy article, just get to the point and say you still believe in Hichilema. Your friend Munshya has now given up. The elections weren’t only in Chilanga, what have you to say about other wards? We have always told you that most Zambian voters decide who to vote for long before even campaigns begin. Although these guys butcher each other during campaigns, there isn’t much that comes out of it. UPND lost the moment they adopted that woman. Charmaine lost because she is Bemba. Tongas can never vote for a Bemba. “Second, the PF’s victory in Chilanga was secured by the advantages of incumbency. Nearly all Cabinet ministers and several PF MPs from Lusaka and elsewhere camped in Chilanga to campaign for Langa.” This guy is just confirming that UPND will lose again in 2021 coz the PF will use all the GRZ and machinery at full throttle. Again this jerk Sishuwa Sishuwa “Aristotle” wannabe from outdated Oxford, your entire post is simply a pathetic justification for the irrational, the solipsism and the ignorant, in other words predisposed which is simply the copulation of ignorance with stupidity. Sishuwa Sishuwa attempt to justify the UPND confirms that the guy has some biasness towards UPND. Waste of pen and paper rather tear and wear of a keyboard from this douchiebag jerk.Spare us from your egocentrism bull sh!it and unresearched crap.We are all scholars by the way. Like the upnd and hh himself, they are always fronting excuses for their political childishness. Sishuwa is trying to justify a new point that says incumbency and abuse of state resources was at play?? And it is for this reason, with supporters like Sishuwa, and all those 1.d.i.o.tic under 5s in upnd that they will continue to lose. Sishuwa Sishuwa (not sure, not sure) is admittedly a good writer. I like his reasoning. To other bloggers, there is no need to insult Sishuwa. What he gives is his opinion and all you do is give your own if you don’t agree with him. I tend to agree with his position. MMD won some of the by elections just before the 2011 defeat. What I don’t agree with is that the absence of moral infrastructure in Charmaine had no effect or influence on the electors. I think it had a lot of bearing, not only in this election but on the moral standi of the party as a whole. “What I don’t agree with is that the absence of moral infrastructure in Charmaine had no effect or influence on the electors” You are telling us to give our opinion coz its his opinion in case we don’t agree.So what is your opinion on the part quoted where you don’t agree with Sishuwa Sishuwa..? No matter in what angle you want to project the recent election what matters is the result. Four, reference to the perceived ethnic profile of Chilanga is unnecessary. The voters have spoken. Well done PF! Well done ECL! Let there be no victor, and there be no vanquished! I think in all fairness the artical is balanced. The man has pointed out the forces that were at play during the elections. Mr Shuwa has even stated clearly that UPND should not give violence as an excuse because their cadres were brandishing guns. Honestly how unbiased would you want someone to be? He even told UPND that Chilanga was never their strong hold and they should look for proper reasons for their loss and not what they have been saying. I think as an honesty citizen this is a very balanced article from which both the winning candidate and losing ones can extract data to run with. Any political party that can use this article positively will win the Chilanga seat in 2021. He even congratulated the Winner. Good Article, keep it up sir. Check how he turns biased at the end of the article when he starts unveiling his opinion. Thats why readers are saying he is biased against PF and Lungu. The not so sure man ends up by giving false opinion that only KK and Mwanawasa were the only presidents who had no moral issues and the rest of them ( Am sure more to do with Lungu ) are immoral and should not be anywhere near the presidency,what a biased opinion. This loss hurts the UPND were it hurts most. They should have realized with the losses in the ward elections, that things had gone sour for them. People get tired of the same insults, then you give them a jezebel to vote for. The people of Chilanga spoke. The analysis above is so flawed and forgets a few fundamentals. Firstly, the issues of use of huge government resources is neither here nor there and there if that was true because Zambia in 2011 witnesses not only one of the most financed election campaign but we well packaged campaign by the MMD. The people of Zambia voted PF with me great resources.